During a performance of Charles Ives’ “New England Holidays,” audiences will see artwork created by clients of four Seattle nonprofits serving the homeless. But this week, homelessness takes center stage in Benaroya Hall during a performance of Ives’ “New England Holidays” (aka “Holidays” Symphony), as part of a Seattle Symphony initiative that aims to build connections with the community. During a performance of “New England Holidays,” an assemblage of four tone poems that celebrate what, to Ives, were the central American holidays of each season — Washington’s birthday (winter), Decoration Day (spring), the Fourth of July (summer) and Thanksgiving and Forefathers’ Day (autumn) — audiences will view intensely personal visual responses to the music that were created by clients of four nonprofits serving the homeless. To give the artwork additional resonance, Claudia Castro Luna, Seattle’s Civic Poet, will preface each movement of Ives’ “American Four Seasons” with a poem written after observing and interacting with those who created the art. The evening will be capped by a rendition of Beethoven’s “Emperor” Concerto by the beloved American pianist Emanuel Ax. The Ives project is a response to Seattle’s State of Emergency Declaration on Homelessness, issued on Nov. 2, 2015. Part of the symphony’s Simple Gifts Initiative, which supports people who are either homeless or in transitional housing, its roots lie in Seattle Symphony’s “Community Connections” programs, which Simon Woods, symphony president and CEO, established shortly after arriving on the scene in May 2011. “When the mayor and county executive declared a state of emergency on homelessness, we began thinking about what the arts could contribute,” Woods explained by phone. Ives’ Holidays Symphony was already on the drawing board for performance and recording when music director Ludovic Morlot realized that it was an ideal opportunity to bring homelessness to the fore. 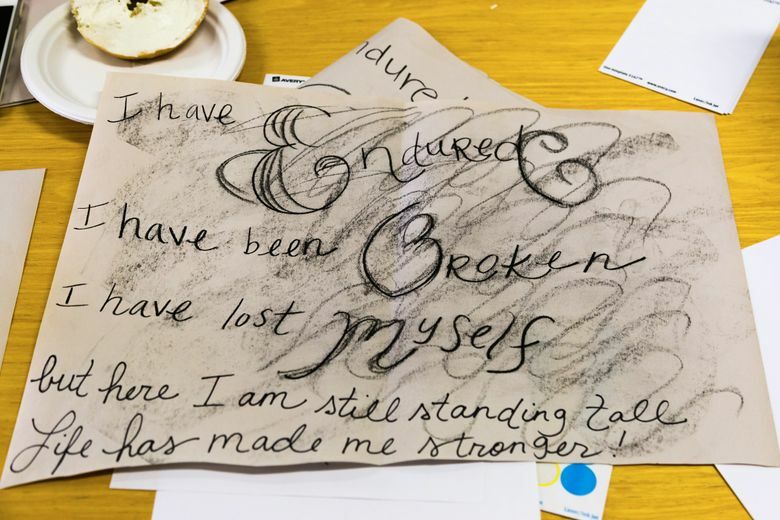 After consulting with its 18 community partners that focus on homelessness, the symphony asked four of them to invite clients in transitional housing to listen to and discuss the music, and create art in response. Each organization’s clients responded to a different holiday movement: Washington’s Birthday (Catholic Housing Services at Dorothy Day); Decoration Day (military veterans from Compass Housing Alliance); The Fourth of July (Mary’s Place); and Thanksgiving and Forefathers’ Day (Cascade Women’s Program of Compass Housing Alliance). Susan Temple, 62, a disabled transgender woman in Compass transitional housing who became homeless due to a nonstop, “physically damaging career” in the carnival, circus and music industries, signed on as a participant. Although Temple feared that her artwork would look childish — “I can’t even draw stick figures,” she confessed — she decided to epitomize her struggle by drawing a boat searching for safe harbor in rough seas. Poet Castro Luna, whose background in urban planning, community work and teaching in the Oakland public schools is complemented by her husband’s work for the King County housing authority, wrote with the intention of incorporating a multiplicity of voices from Ives’ time and the present. Given that Ives incorporates any number of voices, songs and hymns into his idiosyncratic pastiche, her work was cut out for her. After listening to the symphony with the participants and Morlot, she asked the participants to write some responses so that her poems would reflect their stands. “My goal was to serve as a witness,” she said. “I really wanted the participants’ voices and experiences — their bodies — to be reflected in the poems.